Appeared in 19 matches with one start against Kentucky (No. 14)…recorded 85 kills, including a season-high nine at Tennessee (9/30) and against South Carolina (10/17)…ended the season with a .224 hitting percentage (85-26-263) and a 1.37 kills/set average…tallied 19 digs and 35 total blocks, two of which were solo…had a season-high five blocks at Kentucky (9/28), against Ole Miss (10/05), and at Alabama (11/23). Appeared in eight matches with one start against Ole Miss (Oct. 29)…had a career-high seven kills coupled with a .385 hitting percentage in a straight-set win over Mississippi State (Oct. 22)…tallied three digs and three total blocks in that match…also had six kills in road matches at Georgia and Ole Miss. Made collegiate debut against Missouri State (Aug. 27)…appeared in nine matches including a start against No. 1 Nebraska (Sept. 9)…established career highs with five kills at New Mexico (Sept. 8) and three digs against Maryland (Sept. 2)…tallied two blocks in four matches. 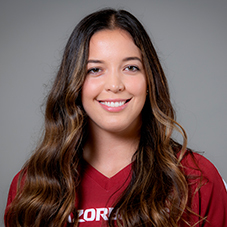 Güitron brings impressive international credentials to Fayetteville, having most recently played with the Mexico National Team at the 2014 FIVB World Grand Prix and 2014 U20 NORCECA Continental Championship in Guatemala. She was also part of championship team at the 2013 U20 Pan American Cup in Cuba. Her international-level experience also includes playing at the 2013 U18 World Championships in Thailand and U20 World Championships in the Czech Republic. In 2012, Güitron had a match-high 18 points in the bronze-medal match of the U18 NORCECA Continental Championship to lead Mexico to qualify for that year’s FIVB U18 World Championships.